Hey guys, it’s Emmaline… I want to share with you my experience of my internship at WiseOceans. 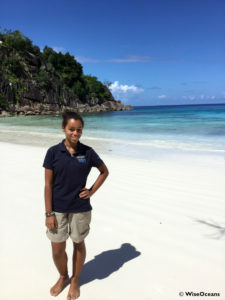 To start off, WiseOceans is a conservation group founded by Abbie Hine that works globally, they were set up in Seychelles 5 years ago and they are situated at Four Seasons Resort Seychelles at Petite Anse. Their main goal is to strive for a better healthier ocean for future generations. 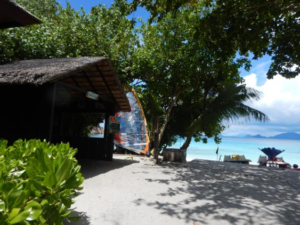 They specialise in marine conservation and education, here at the resort they mostly raise awareness with guests doing guided snorkels, marine life talks, kids activities and they also reach out to public community such as schools. The other part of what they do is conservation work, this means doing coral surveys – that’s a way of checking the health of the corals. They have a project known as the Reef Restoration Project which they grow new corals in a nursery to try to restore the diversity of corals. Now let me tell you about my time spend at WiseOceans. It was really interesting and fun! I’ve spend my time in the coral cabana where I had the chance to learn more on marine conservation, on fishes and corals. Every morning I go for a turtle walk which is searching for any turtle nest on the beach, the beach at Four Seasons is so wow! This was my first impression on my first day and it still amazes me everyday. I also did some fish identification training when we go out for snorkelling, I point out to a fish and say its name. 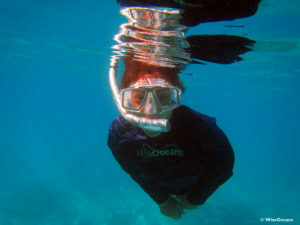 The snorkel is the best part of the day because the reef is occupied by many different fish that’s really nice to see. I did a coral survey that was interesting. There is also a picnic table that holds different types of books about marine life, such as fish identification books also books on sharks that guest can come read or search for info on a certain fish. My supervisor’s name is Georgie she is the Reef Restoration Project Officer, with her I learned about the Reef Restoration Project. They decided to do this project due the coral bleaching and the crown-of-thorns starfish outbreak. They do it by building a nursery with bent steel arcs fixed to the sea floor, then they collect fragments of corals which are still alive to bring them to the coral cabana to be attached with a clean small piece of steel, then they are placed in the coral nursey to grow. When the coral fragments become strong enough they will transplant them out of the nursery to be attached with the reef for them to continue on growing. Coral takes a very long time to grow, during a year some fast corals could only grow up to 10cm, we can say that this projects gives a boost for helping the growth of corals. To conclude I would like to thank Georgie and Hannah at WiseOceans for this amazing experience and keep on doing the good work. I had a great time learning about marine life there were lots I didn’t know about especially the corals. Did you know that they are animals? And there’s an animal known as the polyp who lives in the coral, without the polyp the coral will die! Anyhow thanks for reading my blog hope it was interesting, please checkout my pictures…..